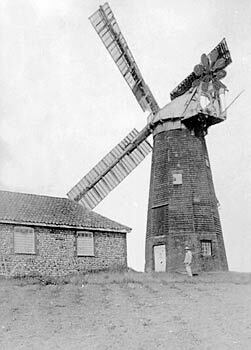 Jermy's smockmill at Sidestrand or Syderstrand, stood on the site earlier occupied by Sidestrand_smockmill that burnt down on 24th November 1836 and that mill was preceded by the even earlier Sidestrand_postmill. 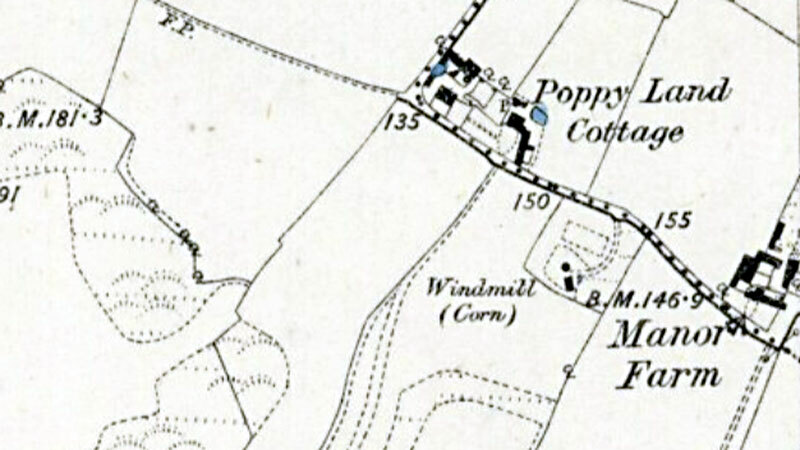 The mill site was actually in the parish of Northrepps. The 10 sided four storey wooden mill was set over a single storey brick base. 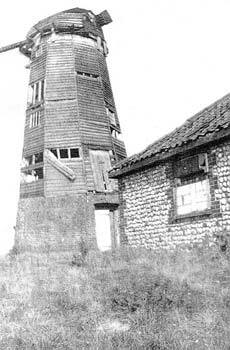 The mill tower was tarred and the mill was sometimes known as the Black Mill. Four double shuttered sails powered 2 pairs of stones. One pair of sails had 8 bays of 3 shetters and the other pair had 6 bays of 3 shutters and 1 pair of 2 shutters. The norfolk boat shaped cap had a gallery and held an 8 bladed fan,each blade was painted red with blue and white bands. The mill was shown on old historic sea charts as the Black Mill and used as a seamark to those at sea. 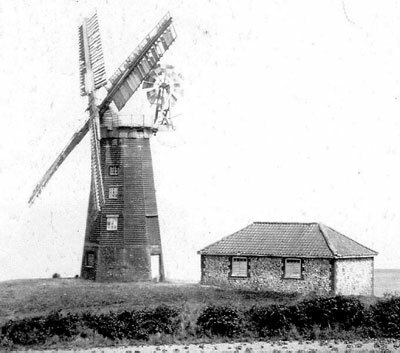 A Capital WOOD TOWER WINDMILL with four Patent Sails, Wind Tackle and other Machinery complete, with a good House, Cottages and Premises and 14 acres of excellent Land, situate at Syderstrand and Northrepps, near Cromer. Apply to Mr. George Simpson, Solr. Tombland, Norwich. Apply to Mr. Henry Lee, Miller, Sidestrand. Mr. Henry Sandford has received instructions to Sell by Auction at Tuckers Hotel, Cromer, Wednesday 22 July 1857 at 4 o'c. All that very desirable Estate situate in the parishes of Sidestrand and Northrepps in the occupation of Mr. Henry Lee as tenant from year to year comprising 15 acres of excellent Arable Land in several Inclosures, a Dwelling House, Cottage, Barn, Stable and Outbuildings, together with a good and well placed WIND CORN MILL in which a lucrative and extensive business has been carried on by the present tenant for many years. Apply to Jay & Pilgrim, Solrs. Norwich or H. J. Johnson, Solr. or the Auctioneer, Cromer. ELLIS NEWSTEAD, the surviving Trustee of the will of Mr. Philip Shickle deceased, to John Gurney Hoare Esq. 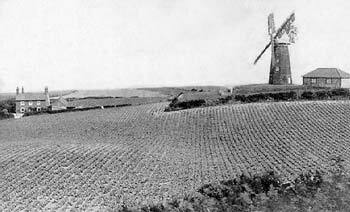 Conveyance of the freehold and covenant to surrender the copyhold parts of an estate at Sidestrand and Northrepps in Norfolk and assignment of wind corn mill standing thereon. 8th December 1857. Large legal document on two sheets, on vellum, with seals and signatures, folded. In fine state of preservation. 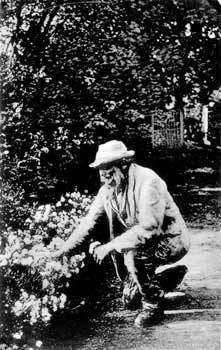 Ellis Newstead is known to have lived in Cromer from 1826 to 1860. He was listed in 1836 as a "lighthouse keeper", and in 1841 as a "ship owner". John Gurney Hoare (1810-1876), a member of the banking family with extensive property holdings in Norfolk, was the prime mover in the battle to save Hampstead Heath from development. Ellis Newstead received a total of £950 for the property. It is unclear as to whether Henry Lee wished to move and erect a new mill elsewhere, replace the existing mill or raise an additional mill nearby. WANTED, a steady active MAN to take charge of a TOWER WINDMILL. A single man preferred. Good recommendation required. Apply to Henry Lee, Sidestrand, near Cromer. WANTED, a steady honest MAN to take charge of a Tower Windmill. A married man preferred. A good reference required. Wanted the last week in September, a steady trustworthy married MAN without incumbances, to take charge of a small Tower Windmill. Apply stating age, salary, experience and reference, to H. Lee, Sidestrand, Northrepps. TO BE LET with possession at Michaelmas next, the Sidestrand WINDMILL driving two pairs of Stones, with Granary, Dwelling house and Premises on which a good trade has been carried on for many years. For further particulars apply to Mr. John Starling, Sidestrand or to Messrs. H. Sandford & Sons, Land Agents, Cromer. The brickwork was inserted after the mill had been jacked up for the purpose either in 1861 or the following year. Constant repairs were necessary which were very expensive, each wooden tooth of the big spur wheel alone cost 3s. 66. to renew. The mill was a tall wooden structure, tarred and falling into decay. On the shaft are names of two old ironfounders, Samuel Brat & Sons and J. Aikman, Lynn, 1831. Alfred Jermy the miller died October 1916 aged 82 after being married four times. During the from the 1860's to 1916 the mill was in the hands of Alfred JERMY. His daughter Maria Louisa was born at the millhouse 1864 and in 1883 she met the journalist Clement Scott of the Daily Telegraph who had been dispatched to Cromer to write and article on the recently expanded rail line from Norwich. The drama critic of the Daily Telegraph and the Morning Post Clement Scott arrived in Norfolk in August 1883. Unable to find himself accommodation he was put up in the Miller's House in Sidestrand. He was so taken with the area that he wrote a number of articles in the newspapers expounding the virtues of Norfolk, which eventually resulted in Cromer and the surrounding area becoming a fashionable place for holidays for the rich and famous. He named his articles and, subsequent book Poppy-land. The book was dedicated to the Miller's daughter.. The millhouse itself became a magnet for other writers and bohemians who followed Scott in search of the tranquil experience he had described so poetically. Whilst for Louie - she was immortalised as"The Maid of the Mill". 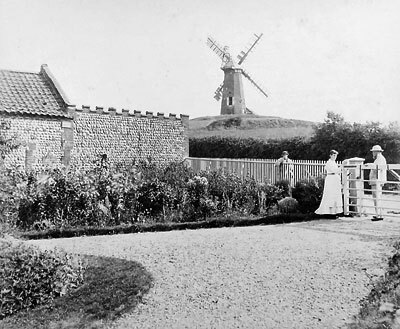 Thus the story of mill at Sidestrand, the miller and his daughter is intwined with the story of the birth of 'Poppy Land' and the tourist industry in Norfolk. For a short period of history the mill and its little family were acquainted with the well known and the famous of London society. It is quite a story. Louie is my first cousin five times removed! Scott wrote the poem the "Garden of Sleep" whilst staying with Louie and her father. My father knew Louie as he was born in 1909 and used to stay with her. I know when dad visited she had moved out and and to quote dad ". . . was living a rather eccentric life." Louie was born in the millhouse on 31st Mar 1864. She died 7th Sep 1934 at her cottage in Overstrand. Alfred was born at Swanton Abbott on 24th Jan 1834 and died at the mill 29th Oct 1916. During his tenancy of the mill Alfred had 4 wives and a total of 6 children.